Home › Australian › Peter Pilt Says He Would Gut A Gorilla To Protect His Daughters. (Strap yourself in). Today I went to sit down to the Channel Ten 5pm News and as I grabbed the remote I simply couldn’t stomach the Australian leftist media trying to assault my brain/consciousness. (No I am not talking about The Project which makes me vomit in my mouth most episodes). So I turned the News off and went and did something very right wing…..I spent time with my daughter….who thinks she is a girl. (And I was there at the birth, she was “apparently” born a girl). And I suspect uses an exclusively female rest room: Which Roz Ward would say No No No. And for the record after talking with Bravehearts and the Daniel Morecombe Foundation yesterday, the Safe Schools program is of no concern to them whatsoever….I have lost respect for both organisations in the last 24 hours. Why don’t you ask them some similar questions? So Australia I suspect now you will explain in the comments where I have failed as a Father, as I have a two daughters who are gender concrete. Hey I just invented a term. Oh and for the record, if a gorilla threatened either of my daughters, regardless of the circumstances, I personally would shoot the animal. I would gut that thing with a knife if needed, to protect my precious daughters. Have deleted my last statement several times. (The statement which is not visible). Suffice to say, Basic common sense and basic humanity has left the shores of Australia. I spoke to a young lady today, who has lived for the past 15 months in Queenstown NZ. She has recently moved back to Australia and she said she can’t believe how much Australia has changed in a short 15 months. Sadly I feel there aren’t too many of us left who are from the right, especially those of us who want to go on the record claiming the Emperor has no clothes. Oh Peter I couldn’t agree with you more! Safe Schools is insidious and darstardly but I can no longer post about it or share articles as my granddaughter says I am being homophobic!!! She is going through an identity crisis and Zi don’t want to inflame the situation or give her ammunition. We must all pray! Tina speak the truth in love. 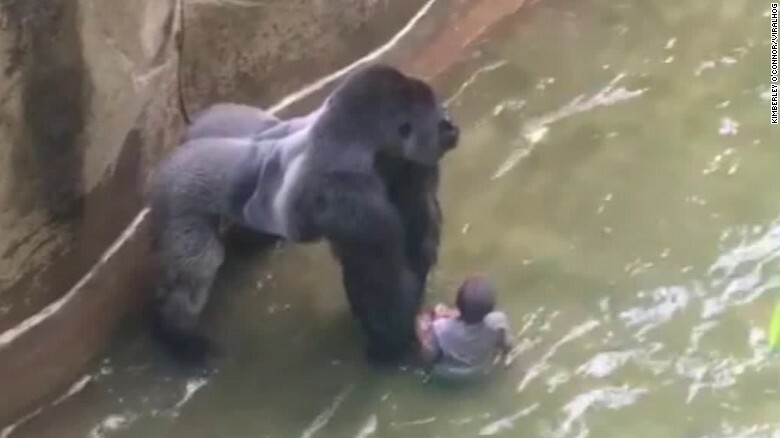 A gorilla is an animal, your daughter is human. Why do people have difficulty understanding that? Peter, the world is out of control as you and I’ve known it in the past. The left wing is in the ascendancy and there are many factors at play here. As a Christian you would be aware of passages which tell us that in the Last Days,’evil would be called good and good evil’. Now we see it happening before our eyes on an almost daily basis. One of the main factors I believe was the plaque proportion of Catholic priests, who defiled the young children in their care. The church and the world at large were aghast at this behaviour and the church, Catholic and Protestant, was labelled as evil. The growth of the feminist movement, the left agenda’s penetration of universities throughout the West, the ‘tolerant’ society, humanism running out of control and then the blessing of every type of evil act and state of mankind doing its own thing as God ceased to exist in the minds of the left ‘progressives’ and others. Today, everything other than Christ, is embraced by those of a leftist mindset, including the attempt to blend all races, religions and political viewpoints . Alarmingly this attitude is expounded and encouraged by the Pope, and an increasing number of traditional Christian denominations, which have succumbed to the seduction of this false spirit – the spirit of Satan himself. In my opinion much of the church and the Pope are apostates. To we who watch from the sidelines, it is patently obvious, that which is prophesied is now being fulfilled before the coming of our Lord. What can we do?We can pray as never before and in faith stand on the promises of God for our sons and daughters, our loved ones and our nations. God has not given us a spirit of fear but of power, of love and a sound mind. In Him we are more than conquerors. In reality we are all standing in the gorilla pit and God has placed a knife in our hands and it is called the Sword of the Spirit. Speak it. Declare it! Never tire of doing good. For in the end we stand with Christ and no weapon formed against us (we who believe) will prosper. What also doesn’t help Fergo is Christians who are also “doomsday” leaning telling us that the Church is unable to complete the mandate to disciple the nations Jesus gave us in Matt 28:19 and therefore we should just give up and wait for Jesus to come back and rapture us out of the mess we’ve let the world get into. You are right, Peter. People are so afraid of offending, they have lost their senses.